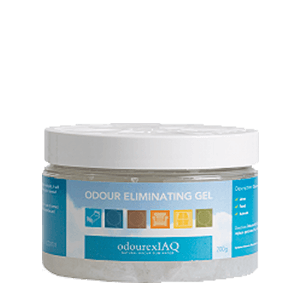 The Odour eliminating gel works in the background for ongoing odour control. Just open and leave, it doesn’t pump nasty chemicals into the air, leaves a smell free environment for approximately 30 days. Like a candle you never have to blow out. A very low-maintenance product, because all you have to do is take the seal off and set it somewhere in the room. Then you’re done! Can put anywhere in room. Just needs ambient air flow. Can place in air vent, so all air coming into room is odour free. We would recommend treating the room with the spray first, then setting the gel in the air vent. lasts for about 30 days. Covers a 10×20 sq. ft. room per get pot. Use in rooms – bathrooms, laundry rooms (soiled linens), musty basements, smoky rooms, etc. Although not recommended it is not harmful if accidentally consumed.